As director of the cult heist movie The Driver (1979) and adaptor of the Jim Thompson classic The Getaway (1972), Walter Hill has a pedigree in filling the screen with the darker side of life. His 1989 film Johnny Handsome, pulled from the pages of John Godey (The Taking of Pelham 123), should have proven no different. Set in a New Orleans mapped out by murky streets and seedy dives bursting with crooks and corruption, the film is a pulpy eighties throwback to traditional noir. What transpires, however, is an overwhelming waste of the director’s shadowy vision. The film starts brightly (or should that be gloomily?) enough with Hill framing the opening like a hazy, liquor-stained dream, or nightmare, aching with the sad, slow Louisiana blues as the camera focuses on the eponymous Johnny. 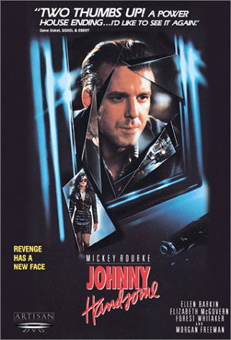 Congenitally disfigured, his nickname a cruel slur, Johnny (Mickey Rourke, smothered by prosthetics) walks down the boulevards of neon desolation, looking as though he carries the weight of a bent world upon his shoulders. The only guy he can count on is father figure Mikey (played with unerring honesty, as always, by Scott Wilson) who asks Johnny to help him pull off a complex heist. More out of loyalty and devotion to his only friend rather than bloodthirsty greed, Johnny agrees. Rather inevitably the robbery goes wrong. 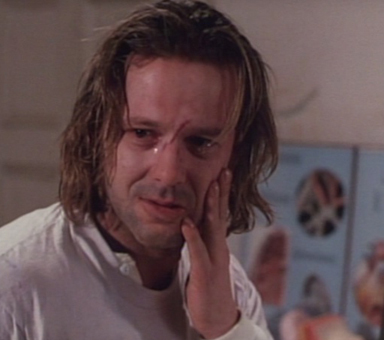 Mikey and Johnny are double-crossed by their white trash partners (Ellen Barkin and Lance Henriksen), leaving the former dead and the latter off to jail to take the rap. Refusing to act the rat, Johnny sticks it out in prison, harbouring dreams of revenge. It’s here that the film slides from the sublime to the ridiculous with a series of plot developments that require not so much a pinch of salt but a bucketful. After a prison attack leaves him in the hospital, Johnny meets possibly the world’s most philanthropic surgeon (Forrest Whittaker, remarkably straight-faced) who offers the convict the ultimate life-change. He’ll remake his face, get him speech therapy and put him forward as an ideal candidate for parole, despite the scepticism of weathered cop Morgan Freeman. Johnny leaps at the chance and is let back out on the streets with one choice: embrace the chance he’s been given and carve out a straight life for himself or use his new identity to commit the ultimate payback. Though chomping through noir traits with relish to ram home the bleakness of its protagonist’s life, the film’s outlandish narrative and B-movie characters ultimately repeal the gloom. Certainly, the increasing hopelessness of Johnny’s situation is absolved by the unbelievable behaviour of those around him, particularly the cartoonish villains of the piece who are about as threatening as Rourke’s little finger. Yet, despite its jarring tone, there are still moments of nuanced goodness within the film, Rourke being one of them. Though hidden beneath some questionable rubber for parts of the film, he delivers a fantastic, downplayed turn, turning Johnny into a man who looks as likely to shatter under his own self-loathing as he is to pull the trigger on anyone who stands in his way. Equally as good is a sparky, young Elizabeth McGovern as his love interest, her soft Cajun patter a welcome antithesis to Barkin’s bawdy Texan drawl. Her chemistry with Rourke and the subsequent relationship between their characters proves to be one of the few believable aspects of the film. It’d be the most authentic were it not for how honestly Hill captures New Orleans, at once lonely and beautiful and unforgiving. Whilst he deploys his usual no-holds barred style more than competently for the action sequences, his uncompromising direction is at its best when merging mercurially with the city. For all of Hill’s attempts to construct the film as a noir fairytale, and despite a sturdy central performance from Rourke, the inescapable, implausible plot ultimately renders Johnny Handsome darkness without the grit. Not the worst eighties crime film by a long shot but a disappointingly missed opportunity nevertheless.